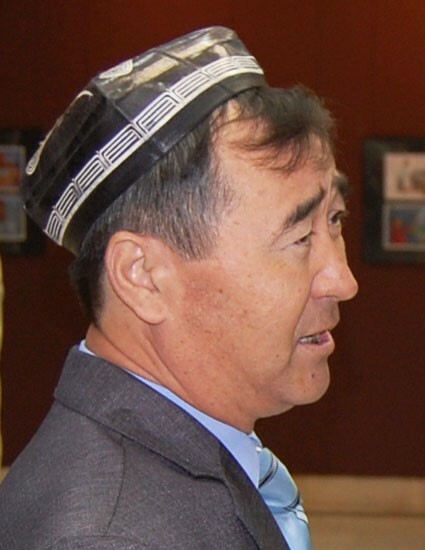 Born in 21.01.1958 in the village Telov in Beshariq district of Fergana province of Uzbekistan. Graduated from Tashkent State Pedagogic Institute faculty of Graphic Art. Member of Artists Union of Uzbekistan. Member Good Humor Party, Poland. He lives in Tashkent city. At present he is freelance cartoonist. He had personal exhibitions in town Krusevac of country Serbia in 2007, in town Osijek of country Croatia 2008 and in Tashkent 2008-2010-2012-2013. In 2008 he has awarded of a State award "Friendship". He is participant in many National and International Cartoon Exhibitions and won 175 prizes. Gold Prize, Nanjing, China 2002; 1st Prize, Tokyo, Japan 2004; Silver Prize, Baku, Azerbaijan 2005; Bronze Prize, Damascus, Syria 2005; Golden Pencil Prize, Tashkent, Uzbekistan 2006; Golden Helmet Prize, Krusevac, Serbia 2006; 1st Prize, Piracicaba, Brazil 2006; Silver Prize, Nanjing, China 2006; 2nd Prize, Bursa, Turkey 2007; Gold Prize, Zagreb, Croatia 2007; Bronze Prize, Guangxi, China 2007; 2nd Prize, ”CafCaf” Istanbul, Turkey 2007; 2nd Prize, San Paulo, Brazil 2007; 1st Prize, Paracin, Serbia 2007; 3rd Prize, “Nature and Man” Istanbul, Turkey 2007-2008-2009; Bronze Prize, Shanghai, China 2007; 2nd Prize Vucje, Serbia 2008; 2nd and 3rd Prize Buenos Aires, Argentina 2008; 1st Prize, Rio De Jeneiro, Brazil 2009; 1st Prize, Tashkent, Uzbekistan 2009; 3rd Prize, Barcelona, Spain; 1st Prize, Campinas, Brazil 2009; 2nd Prize, San Paulo, Brazil 2009; 3rd Prize, Beijing, China 2010; 3rd Prize, San Paulo, Brazil 2010; 1st Prize, Tashkent, Uzbekistan 2011; 3rd Prize, Almaty, Kazakhstan 2011; 1st Prize, Osten, Macedonia 2011; 1st Prize, Buenos Aires, Argentina 2011; 3rd Prize, Almati, Kazakhstan 2012; 1st Prize Barcelona, Spain 2012; 2nd Prize Lagos, Nigeria 2012; 1st Prize , Istanbul, Turkey 2012; 3rd Prize, Brezno, Slovakia 2013; 2nd Prize, Tehran, Iran 2013; Copper Panda Prize, Beijing, China 2013; 1st Prize, Porto Alegre, Brazil 2014; 3rd Prize, Brugairolles, France 2014; 2rd Prize, Brezno, Slovakia 2015; Great Prize, Ploiesti, Romania 2015; 3rd Prize, Olen, Belgium; 2nd Prize, "The Cartoon Contest, connected with Railway” Moscow, Russia 2015; 2nd Prize, “Moscow, Russia 2015; 2nd Prize, Bangalore, India 2016; 2nd Prize, “The International Cartoon Contest Bride's Veneration” Theodore, Macedonia 2016; 1st Prize “Mostra Virtual Humor” Brazil 2016.